This year is the 75th anniversary of the Golden Gate Bridge painted in its custom vermillion color dubbed international orange. According to Wikipedia the iconic orange "is a color used in the aerospace industry to set things apart from their surroundings, similar to safety orange." This is precisely why the color was chosen. When the pieces of the bridge arrived for construction they were already painted in the orange primer. Originally the Navy pushed to paint the bridge in yellow and black stripes for better visibility. But can you imagine the bridge looking like a giant bumblebee? 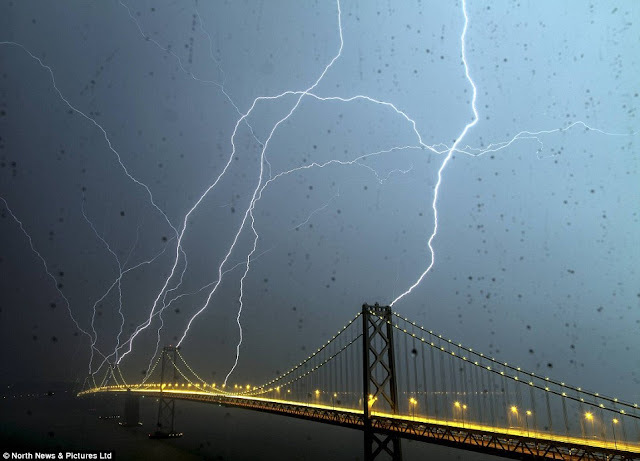 In honor of our colorful local icon we wanted to share some of our favorite images of the Golden Gate Bridge this week. 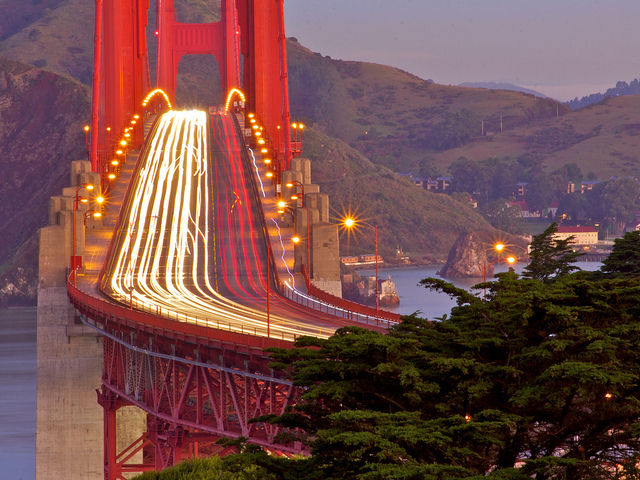 Chris Saulit on Flickr took this long exposure beauty with the Marin Headlands a soft green behind the glowing orange of the bridge. This image illustrates one of the primary reasons the bridge was painted international orange. As the official Golden Gate Bridge site tells us: The "Consulting Architect Irving Morrow selected the distinctive orange color because it blends well with the span's natural setting as it is a warm color consistent with the warm colors of the land masses in the setting as distinct from the cool colors of the sky and sea. It also provides enhanced visibility for passing ships." The Golden Gate Bridge Research Library site reveals a bit of the history of the color decision. "In his April 1935 Report on Color and Lighting, Morrow defined the approach to the color section, “Preliminary to discussion of particular colors, a decision must be made on a matter of policy – is it desired to emphasize the bridge as an important feature of the landscape, or to make it as inconspicuous as possible.”" The bridge would hardly have become the tourist sensation is it today if they had gone with inconspicuous gray. Look to the Bay Bridge, a far larger and perhaps more impressive engineering feat, it draws little attention in slate utilitarian grey. "Italian American sculptor Beniamino Benvenuto Bufano submitted his comments to Morrow, “ I have been watching very closely the progress of the towers on the Golden Gate Bridge in its structural beauty its engineering and architectural simplicity – and of course its color that moves and molds itself into the great beauty and contours of the hill – let me hope that the color will remain the red terracotta because it adds to the structural grace and because it adds to the great beauty and the colorful symphony of the hills—and it is because of this structural simplicity that carries to you my message of admiration.”" Indeed. 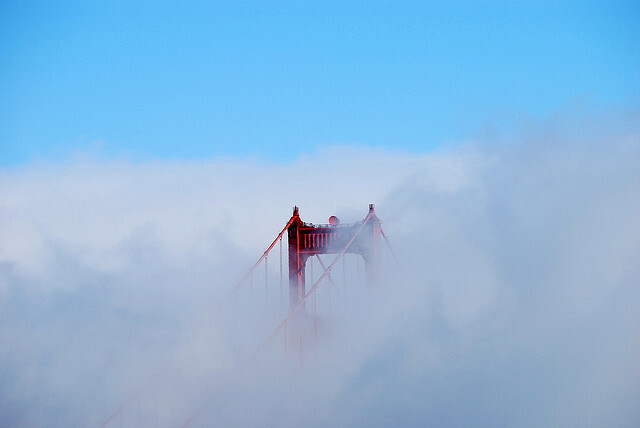 Nathan Jones on Flickr took this beautiful shot that catches the bridge peaking through a thick fog bank. If your love of the bridge has you inspired to paint a wall or even your whole house to match the iconic color, Sherwin Williams can help. Online we found the formula for the Bridge’s unique International Orange color. Paint stores can mix it with the following information: CMYK colors are: Cyan: 0%, Magenta: 69%, Yellow: 100%, Black: 6%." Currently the bridge is painted using a Sherwin Williams custom matching formula but for the closest off-the-shelf color they claim "Fireweed" is the best. So here's to 75 years of a color icon. May it have many more to come.